NP Upadhyaya: Kathmandu: Imran Ahmed Khan Niazi, the just sworn in Prime Minister of Pakistan has won the war on India without firing even a single shot. Call it a sixer or whatever you may prefer, yet the fact is Imran’s swearing in ceremony itself has shaken the entire Indian establishment from within in that a modest Indian Congress stalwart Nav Jot Singh Siddhu, a Punjabi Indian national’s presence in Islamabad and his embracing of the Pakistan Army Chief Qamar Javed Bajwa has brought about a sort of earthquake of the eight on the Richter scale. Modified media is the hardest hit for some mysterious reasons. Looks like Inferiority complex at its height. The all-time jolly Siddhu, a longtime friend of the Pakistan’s new Prime Minister had been invited by Immy to grace his swearing in ceremony, August 18, and the Indian Punjabi, a sitting minister in Punjab cabinet, honored the friendly request by completing all the required Indian government’s formalities and thus he stepped in Islamabad and graced the entire proceedings. (By the time of writing this story, Siddhu is back in India via Wagah border). However, the ever inimical Modified Indian media took the Siddhu’s presence in a different manner and tried to not only distort the entire event but even dared to take Siddhu, the innocent Punjabi, tentatively as a traitor and his nationalist credentials even being challenged. Siddhu as is his habit remains undeterred. In fact Siddhu is being taken as a hero now in India save a few sick mindset. The Indian media since then has gone crazy and disseminating all the nonsense with the sole aim to damage the political credentials of the former Cricket player from India. Siddhu’s fault? Yes! He was awarded a seat in the front row which per chance was very close to the seat of the President of the Pakistan Occupied Azad Jammu and Kashmir. The fact is that he took his seat where he was told to sit. The second grave blunder? That Siddhu exchanged views with the Pak Army Chief who told his Indian guest that Pakistan wishes peace with India. And in the process Siddhu definitely got emotional and the two, Siddhu and Qamar Javed Bajwa, embraced each other. This created ugly scenes in India. People from the various discipline began targeting Siddhu and some even suggested Rahul Gandhi to strip from the Party’s membership before he lands in Punjab. Brahma Chellany is the hardest hit for mysterious reasons. The sober Punjabi minister is being criticized very badly which bodes ill for the entire Indian nation ultimately. Polarization of the Punjabis from the mainstream Indian citizens may hit the nation hard and the consequences may not be that pleasant. What if the rest of the Punjabis join the Khalistan club? Chances remain fair that the club may take a formal shape time permitting and thus The Indian government and the media is hereby advised, as Nepal has been watching the entire events as regards Siddhu and the calculated insulting campaign that has been initiated in India against the honest and sincere Punjabi, not to chase Sidhhu and push him to the wall. A cat if pushed to the wall, begins scratching whosoever comes in the front. Thanks Siddhu is a strong nationalist. If his nationalist credentials is challenged then he too can go to any extent whose climax is known to the Indian government. Siddhu beamingly claims that he is well introduced with this veteran Cricket player, Immy, and hopes that the Khan will remain true to his commitments and that if we take one step ahead then he has told the entire world that he would advance two steps in order to sort out the Pakistan-India lingering dispute. Indian restiveness has no ground in that Siddhu and Qamar Javed Bajwa both belong to the Jatt community and thus they have every strong reasons to embrace each other and what is the harm if the two hugged each other? If Modi can hug his distant relatives not from Gujarat of the likes of President Trump, Xi Jin Ping and Vladimir Putin and finally Miyan Nawaj then what if one Jatt hugs the other who till the other day tied to the same roots? He hugs PM Oli and Prachanda also let alone SB Deuba. The newly appointed foreign minister of Pakistan Shah Mehmood Qureshi has set the ball rolling. He has said that “it was vital to resume talks, which have made little progress in recent years, between the nuclear-armed neighbors who have fought three wars since the days of partition in 1947. “We need a continued and uninterrupted dialogue. This is our only way forward,” he told reporters in the capital Islamabad August 20 immediately after he was made the Foreign Minister of Pakistan in Imran Khan’s cabinet. This means that the new PM of Pakistan has shown positive overtures with regards to the normalization of the Pakistan-India ties as per the promise he had made just after the election results last July. As Imran Khan according to his avowed promise, has said that if India takes one step then he will take two steps and that high placed sources say that PM Modi while congratulating Imran Khan had expressed his fervent desire for bilateral talks so now the initiative must come from the new PM from Pakistan. This is a good news for the entire South Asian region. Now that both the arch rivals have already expressed their internal desire to have composite dialogue in between the two thus it can be hoped that both India and Pakistan shall meet, as per their declarations already made, and wish to set their relations in order and let the South Asian people live in permanent peace which is long overdue. Pakistan, as the Minister Shah Mehmood Qureshi has already made the verbal commitment for peace with India, and since he is well equipped with the explicit backing from the pronouncements made by the Pakistan Army Chief Qamar Javed Bajwa while hugging Nav Jot Singh Siddhu, August 18 at the swearing in ceremony of New Pakistan Prime Minister, that “We want peace with India” makes the road clear for Pakistan to make serious political gestures that are aimed at building peace with Pakistan. If Shah Mehmood Qureshi does so and if the Indian side too exhibits equally its interest in building peace in the south Asian region then the available moment is perhaps the best one wherein the two inimical countries ( only at the government to government level but not at the people to people level) can ensure the prevalence of peace not only in the disputed area of Kashmir but also in the entire South Asian region which, let’s admit the fact, has remained hostage to the fanaticism of the two countries, India and Pakistan. Let’s learn more from the new Foreign Minister of Pakistan as to how he took the India-Pakistan bilateral relations in his maiden speech. Foreign Minister, Qureshi said: “I want to tell the Indian Foreign Minister that we are not just neighbors; we are atomic powers. We have a lot of common resources. In telling so, perhaps the minister reminded India that she should not berate Pakistan as the latter too was a nuclear country in her own right. The fact has been put straight as demanded by India. “Us coming to the table and talking peace is our only option. We need to stop the adventurism and come together. We know the issues are tough and will not be solved overnight, but we have to engage,” he said. This means that the minister is talking sense when he says that dialogue has no alternatives. In saying so, the minister acknowledges that it would be not that easy in sorting out the bilateral issues that have plagued the two nation since seventy years or so but yet “efforts must be made and those efforts must be serious ones. Perhaps this is the implied message. The message is also to give yet another chance. “We cannot turn our cheek. Yes we have outstanding issues. Kashmir is a reality; it is an issue that both our nations acknowledge… We need a continued and uninterrupted dialogue. This is our only way forward,” the foreign minister added. Quereshi said the two countries may have a different approach and line of thinking, but he wants to “see a change” in how we behave. This means that Qureshi prefers now that both India and Pakistan change their previous mindset or say stances over the dispute complexities so that the composite dialogue yields positive results. 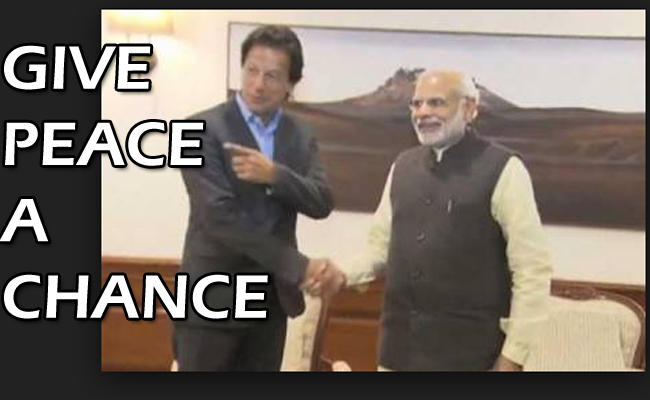 This hints that PM Modi took the first steps, contrary to the opposite claims made the other way round, and thus Prime Minister Imran Khan needs to take two steps for building peace with India as promised in July. Qureshi, emphasizing the importance of fostering better relations with neighboring countries, said: “I will try to bridge the trust deficit between Pakistan and other regional countries,” the Dawn newspaper reports which has also been reported by various news agencies. A South Asian terrorist himself talks of making SA Terror free. What a joke? In his inaugural address to the nation after being elected as prime minister of Pakistan, Imran Ahmed Khan Niazi had unveiled a roadmap for his government. (Courtesy Pakistan TV channel). How he takes up the challenging issues of the Himalayan order that has begun to confront him from the moment he has assumed the hot seat is not of our concern, however, what is our prime concern is that his modesty exhibited while talking to his countrymen through TV channels should be a matter of learning to Nepal’s political stalwarts from the Pakistan Prime Minister on how an intimate and sound relationship has to be made in between the lay men and the rulers of the country of the stature of the Prime Minister. Imran was simply superb in openly asking for people’s help and support so that finally he could be of substantial support to those who supported him. This means Imran needs the people’s support for his would be initiatives only to serve the people of his own country. Imran Khan has abundant issues to be addressed with as per his own admissions. The first cabinet meet under Imran Khan has already taken some steps to keep his promises made prior and after the poll results. The modesty with which he put his things and the manner he preferred to convince the people, his voters at large, were simply exemplary which perhaps has no parallels in South Asian political history so far. (As observed in the Idiot Box). Imran Khan, who swept to power last July on a populist platform vowing to root out corruption among a misguided (?) elite and lift people out of poverty, has politely vowed to make Pakistan an Islamic welfare state, and appealed the masses to bring change in their lives. “Country will head towards disaster if we don’t change our direction,” he said in his address broadcast live by state-run PTV. The prime minister in all his modesty said he will follow Medina’s example to rid Pakistan of its chronic problems. “They did not borrow from Roman or Persian empires. They strengthened the people and made them self-sufficient,” he added. The example of Medina came as a bolt from the blue but correctly stated in Pakistan’s context. His stress was to bring to a complete halt to the massive cases of child abuse in Pakistan which is also an issue with Nepali children more so with those have made the street their homes. Back home in Nepal, listening to the role model of the South Asian political spectrum, Imran Khan, Nepali observers remain askance as to how long it will take for Nepali rulers to be polite and modest and speak so passionately in favor of the ones whose collective votes have elevated their ranks from the original footpath to the power corridors? Not in our life time perhaps. Neither our leaders are polite not do they possess clear cut road map for their countrymen. They have, honestly speaking, copied the arrogance of Narendar Modi and scolding the national population through the use of legal codes that has just come into effect. Instead of correcting the prevailing societal blunders, the sudden emergence of the notion that fathers are the rapists has tentatively polarized the already fragmented society wherein foreign money appears, it is largely believed, to have been involved in inciting hatred. The band of the NGO/INGO female activists perhaps forget the fact that it was their father’s natural intimate love affairs with their mother that has given birth to the ones who cry foul against their own fathers and prefer to call the father(s) as number one “RAPISTS”. This slogan that fathers are rapists is unacceptable for multiple reasons which if not checked on time may disturb the entire natural balance of the society which may finally spread some sort of hatred in one’s own family. The society thus stands at the crossroads. In addition to all the malaise confronting the nation, the Nepali press has almost landed in trouble in that some laws-by laws contained in the freshly enacted civil code appear to be draconian in nature and time permitting the RED government may pounce upon the Nepali press. Media freedom is at stake in Nepal, so claim the men who have controlled the Nepali press world. The RED government enjoys two thirds majority in parliament. The Communist government has tightened its grip on national media including social sites. Only recently s Nepali national was sacked for having expressed his ire against the Prime Minister. The days ahead are frightening in that the Communist dictatorship is perhaps taking a formal shape in Nepal. Thanks China’s dictatorial practices are being brought to practice in Nepal. India is grabbing our lands. China is inclined to silence the Nepali press. The Nepal Police has gone crazy of late. The fate of Nepal is doomed.